Inspired by conversations on the FOOD52 Hotline, we're sharing tips and tricks that make navigating all of our kitchens easier and more fun. Today, we're sharing ways to use bottarga. The workmen who built the Egyptian pyramids may have subsisted on onions, bread and beer, but just a few centuries later their descendants were enjoying their flatbread topped with bottarga. Sometimes referred to as "the poor man's caviar," bottarga has been a Mediterranean staple ever since. Bottarga production is the same today it was in ancient Eqypt: tuna or grey mullet roe is salted, pressed, dried and then coated in beeswax for preserving. The Lebanese bravely eat their bottarga in slices with raw garlic and dunked in olive oil, but the deep orange roe is most often shaved or grated to adorn everything from pasta to compound butter with its bright, briny flavor. Like anchovies or caviar, it adds salt and umami, but with a feathery texture and personality all its own. Bottarga is made in Europe, Asia, and now the U.S. You can find it in specialty food shops, or in a variety of online retailers. Below, we share some tips and tricks for working with this saline treat. 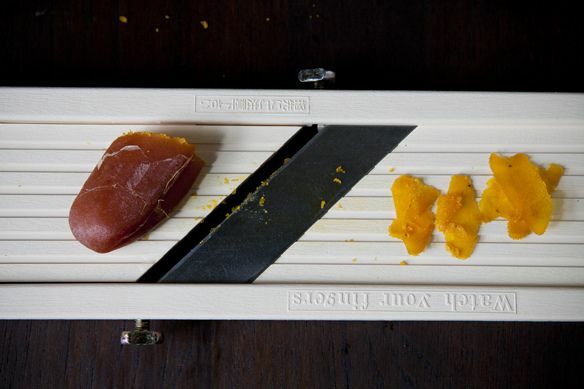 Nick Anderer of Maialino in New York City suggests using a mandolin to shave the roe, and a microplane to grate it. We were surprised -- and delighted -- to learn that he leaves the natural casing intact. 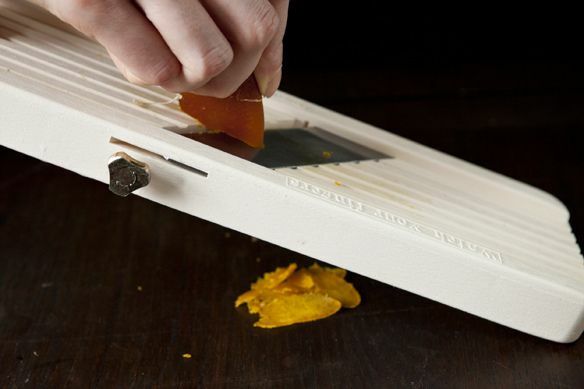 Flatbread: Italians like to shave bottarga over a paper-thin flatbread called carta da musica. In her cookbook, A Girl and Her Pig, April Bloomfield includes a recipe involving nothing more than carta da musica, bottarga, butter, flaky sea salt, red pepper flakes and extra virgin olive oil. Pasta: Another Italian tradition is bottarga with pasta -- most notably, spaghetti alla chitarra con bottarga. At Maialino, Anderer makes a simple sauce with garlic, olive oil, parsley and white wine. Slicked in this sauce, spaghetti is served on a bed of grated bottarga and finished with yet more bottarga. 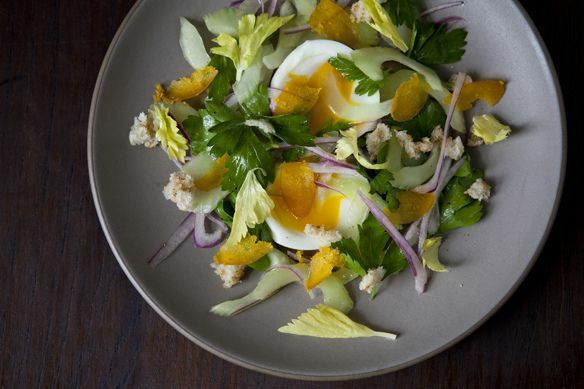 Eggs: Anderer's celery salad with soft boiled egg and shaved bottarga (pictured above) is crunchy, creamy, and salty all at once. 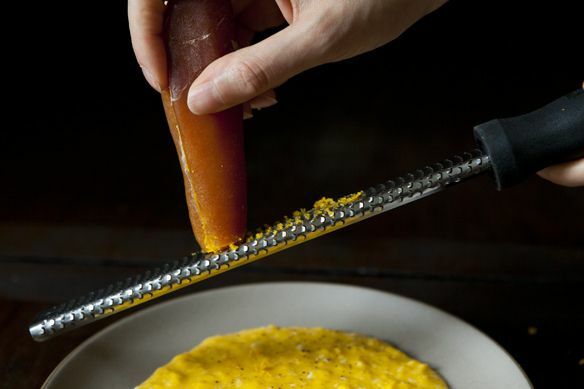 Or try bottarga grated over scrambled eggs. Vegetables: Shaved or grated bottarga is great for livening up fresh vegetables. Try it with boiled potatoes, raw zucchini, asparagus or green beans. Bottarga can be kept in the fridge for up to a year, as long as it's vacuum sealed or wrapped tightly in plastic. Are you a bottarga fan? If so, how do you like to prepare it? I'm Laura Loesch-Quintin, a food writer and photographer, as well as the voice behind the recipe blog gourmette•nyc. Originally from Philadelphia, I was raised in a French-American household where vinaigrette, cornichons, and clafoutis were (and still are) staples. When not cooking, writing, or photographing, I can usually be found exploring the food markets of New York City. Some of these preparations are strange (butter? No!! ), but it's nice to see bottarga get some love. I love it sliced thinly with young olive oil and celery. It's also nice grated on top of spaghetti and clams cooked with garlic, parsley and white wine (or by itself on spaghetti with some olive oil). Maiden Lane in the East Village has this on the menu today!!! I am so making that salad. I brought back a hunk of bottarga from Eatily. Your recipe looks delicious! Thanks for sharing. Thanks for the bottarga writeup. I've looked in the past and found it very difficult to obtain. Now that you suggested a source, maybe I can get some. I wonder how long it lasts? Yes, I encourage you to try this bottarga -- it's delicious. With regards to how long it lasts, as mentioned above, bottarga can be kept in the fridge for up to a year. It's actually quite easy to make at home. Get roe sacks from you local fish market. My guy sells 'em really cheap when they're breaking down a whole fish. Pack the roe sacks in salt, change the salt out every couple days, and do that for 2 weeks.